What grapes and percentage are used in your Super Tuscan. The Super Tuscan is typically a blend of Sangiovese and Cabernet Sauvignon. Thanks for the question Peter. Enjoy the wine! What is the expected finishing ABV% for the Super Tuscan? Is it possible to get an accurate original gravity reading, aren’t some sugars contained within the grape skins? If they are not dissolved in the mist pre-fermentation will a hydrometer accurately include those sugars in its gravity reading or not? When making any of our wine kits that come with GenuWine Crushed grape skins we highly recommend taking your original SG reading after you have added the skins and have mixed the primary fermenter well for 30 seconds. This will give you the most accurate potential alcohol of the wine. Once your wine has finished fermenting (approx. day 14) take your final SG reading. To calculate the final alcohol of the wine use this equation as an example. This wines alcohol content is approximately 13.4%. If you fermented the wine down to a final SG of 0.994 your wine would have a final alcohol content of approximately 13.9%. Can you provide the exact percentages of the different grapes used in the 2015 Super Tuscan? I want to enter it in a contest that requires this information. Does it contain any Cabernet Franc, Merlot or Petit Verdot? If so, can you also provide these percentages? Super Tuscan is a proprietary blend of Cabernet Sauvignon and Sangiovese. I’m on day 16 of the fermentation and my specific gravity is about 0.997. I racked it into a carboy a few days ago at 1.010. There is still obvious activity going on in the carboy as fine bubbles are rising. Is this a malolactic fermentation? It sounds like for your fermentation is almost finished but not quite! Some wines can ferment all the way down to 0.992-0.994 which it looks like this wine wants to do. If you continue seeing fine bubbles rising to the surface of the wine and the SG remains at 0.997 it is possible that it could be MLF. This is highly unlikely as our juice is pasteurized which would eliminate any lactic acid bacteria from the juice. If you have inoculated your wines before with lactic acid bacteria in this same carboy than it is possible you have accidentally started MLF. Keep checking the SG and if you notice that it isn’t moving any further I would recommend clearing and stabilizing your wine. I received my order and am about to start. In the package there are two Genuwine Grape Skins each package is 1.25 kg. Is this correct? I don’t think I had two packs in my other purchases of the same wine kit. If the kit only requires one package of 1.25 kg can you suggest another kit that would benefit from adding these grape skins? Or if I used both packages to this one kit would it be advantages? This is my favorite kit and will be ordering more in the near future. Please use both bags of Genuwine Winery Grapeskins when making your Super Tuscan. Both bags add more flavour, body and tannin to the wine. How long are these kits good for past the date on the box? 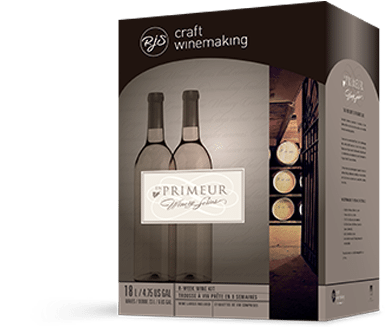 We can not guarantee the quality of your wine past the expiration date on the box. However, different kits may stay “fresh” longer than others so it is hard to give you any specific advice. Best thing for you to do with an expired kit is make the wine and taste for yourself! If you like it, than you are lucky. If not, time to buy a fresh kit. What country do the grapes come from? The juice in this kit comes from Italy. What is the liter size of this kit? Thank you for your question. The kit is 18L, and once crafted makes 23L. Super excited about this wine! I need to add a similar type wine to reduce air space in my carboy. What should I add? Cabernet? Sangiovese? Both? I really don’t want to mess this one up! Thank you for your question! You don’t need to top up your wine but if you would like to, we recommend that you use either a Sangiovese or Cabernet Sauvignon, as both grape varieties are included in the blend. For additional information on products, please call our toll-free help line 1-800-663-0954 or email us at rjsinfo@arterracanada.com. Where is the “use before” date on the box? Thank you for your question. All of our products have a Product Date Code located on the box label. We recommend that you craft your kit within 1 year of that date code. For additional information on products, please call our toll-free help line 1-800-663-0954 or email us at rjsinfo@arterracanada.com. Made two kits of the Super Tuscan. Added additional oak to one of them. Taste tested at 1 year in the bottle – EXCEPTIONAL!! I prefer the one with added oak, although the difference is slight and subtle. Will only get better with age! The Grenache Syrah in this series is also very good – looking forward to trying the Zinfandel. Thank you for so much for sharing your feedback with us, and we’re happy to hear that you enjoy this kit! Cheers. I’m wondering what are the volumes for the stabilizers used in the Super Tuscan kit? How many grams are the packets of Bentonite, sulphite & sorbate (2) and how many mls are the packets of Kieselsol & Chitosan? For additional information on products, please call our toll-free help line 1-800-663-0954 or email us at rjsinfo@arterracanada.com. Hi Tom, our Instruction Sheets are available on our website. If you click on the product you bought, there will be a small icon for our Instruction Sheet.